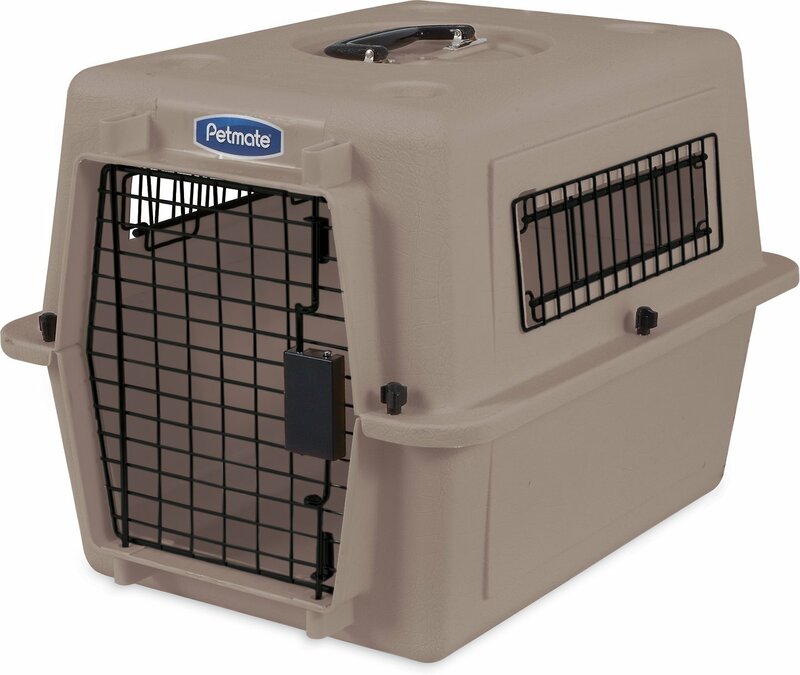 Train your pet, travel with your pet and keep him safe with the Petmate Ultra Vari Pet Kennel. The sleek design comes with durable hardware that won’t corrode, so it's secure and easy to assemble. It features a heavy duty plastic shell, wire doors with an easy-open squeeze latch and metal side vents to promote healthy air flow. The Vari Kennel Traditional is eco-friendly and meets most airline requirements, but exclusions may apply. Be sure to check with your airline well in advance of your travels to learn about their individual requirements. Heavy duty plastic shell provides strength, durability and safety. Durable wire door keeps pets in, but allows easy access to pet owner. Portability makes this kennel perfect for trips and adventures. Provides ventilation so your pet gets a healthy airflow. Meets most airline requirements for safe traveling. Click here for the Petmate Airline Travel Kit. The crate is great. Just what I wanted...except...I ordered the color Bleached Linen. What arrived is a dark taupe. The pictures show Linen and Blue. Where did the gray come from?? Otherwise, the crate is great. Petmate Ultra Vari Pet Kennel is definitely not "Ultra". The plastic construction has rough edges and the "quick and easy" construction suffers from really cheap bolts and self tapping plastic wing nuts. The manufacturer must know the wing nuts are junk as they supply more in the package than are required for assembly. I don't like the term 'cage' so we call this Gordie's House. He was crate trained when we got him and he sleeps in there all night and we put him in there when we leave to go anywhere. We were told that a Chihuahua has anxiety when left alone and they need the security of a "house", he loves it and has plenty of room. I just wish it came with some kind of water bowl thing. We have a shih-tzu who will and did chew a hole in one of the cloth carriers (mesh & nylon)when we left him at home while we went shopping. This one is solid and has metal vents and front door and there is nothing to chew on except metal because of the clever design of the product, Great product, works for us. I received these 2 crates one had a crack in the top of it, and the other had a piece missing out of the top. Received it the next day!!!!! I was worried how a crate could be priced so low and still be a good quality, but this was as good as I could have wanted and at a great price. Perfect! Easy to put together,light weight and sturdy. Very nice,our old ones door handle broke and it was difficult to get the puppy out. Thank you for a great product.we love the solid construction. Just what the doggie ordered. I bought this for my daughter's rapidly expanding Bloodhound puppy. The wire kennel that she had was too small and the dog was agitated and bending the bars. With the bigger kennel with enclosed sides is working out well.